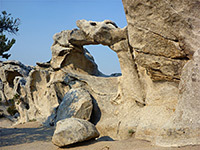 Apart from Yellowstone National Park, of which Idaho contains a small section, there are only two NPS-managed scenic areas in the state - City of Rocks and Craters of the Moon. The Park Service also administers Hagerman Fossil Beds, notable only as the site of fossil excavations, and two national historic parks. 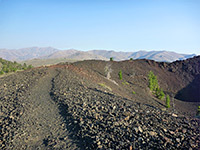 In addition there is one USFS preserve, Hells Canyon National Recreation Area. This small reserve has a rather remote location in far south Idaho, occupying a section of the Albion Mountains where the granite bedrock is eroded into ridges, spires, arches, cliffs and ravines. A short, unpaved road crosses the preserve, which is home to a good variety of plants and wildlife. This location lies right at the north edge of the Great Basin Desert, and experiences high temperatures in summer. Camping, rock climbing and hiking are the main activities; visitation is generally low. Ancient lava flows cover much of the Snake River Plain in south Idaho, and the most scenic and varied area is protected as the evocatively-named Craters of the Moon National Monument, accessed by US 20/26/93. Volcanic features include cinder cones, spatter cones, lava caves, fissues and tree molds. A 4 mile scenic drive penetrates a little way into the lava field, past viewpoints and trailheads, for eight short paths and one longer, backcountry route. The Hagerman Fossil Beds contain the remains of many plants and animals from the late Pliocene epoch. They are exposed in barren, grassy hills bordering the Snake River, 30 miles from Twin Falls, and are part of a very little known and lightly visited national monument. The visitor center/museum has many specimens but there are no in situ fossils; facilities are limited to a couple of scenic overlooks and a short trail. The deepest canyon in the US forms the centerpiece of a large national recreation area, spanning the Idaho-Oregon border, and including 104 miles of the Snake River, between Hells Canyon Dam (river mile 247) and the Washington stateline. Included within the preserve's 652,488 acres are over 800 miles of trails, most crossing very remote terrain. Minidoka NHS preserves the site of one of the relocation centers where Japanese people were imprisoned during the second world war. There are no visitor services, and not much to see; only foundations remain of most of the buildings. 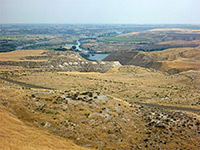 The site borders the Snake River, 15 miles east of Jerome. The Nez Perce Indians are commemorated by this dispersed historical park comprising 38 sites in four states (Idaho, Montana, Oregon and Washington). Individual units include battlefields, viewpoints, camp locations and graves; most are concentrated in north Idaho, between Kamiah and Lewiston. The incomparable Yellowstone National Park - predominantly in northwest Wyoming but partly in Idaho - is world-famous for three factors: the amazing geothermal features - over 10,000 geysers, hot springs, fumaroles & mudpots, the beautiful mountain scenery and the abundant wildlife, which includes bison, elk, moose, wolves, black bears and grizzly bears. Yellowstone was the World's first national park when created in 1872, and would be even more popular were it not for its rather remote location and limited visitor season - heavy snow causes closure for 5 months during winter.